Remember when Republicans used to lecture Democrats about family values and honor and dignity? 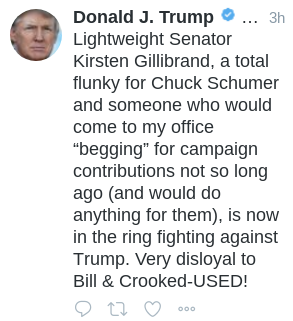 Yes, that is your president basically saying that Senator Gillibrand offered him sexual favors for money. Among other things. Oh, and we're about to see if a credibly accused molester of underage girls and totally insane racist theocrat is going to become a member of the US Senate.